Two of the best silly phrases we first hear about are learned in kindergarten. We learn them early, but we use them forever. With the help of this rhyme, numbering the days in each of the months will not be difficult to grasp. If kids have difficulty remembering the difference between the top and the bottom part, the numerator and the denominator, of a fraction, we can help them remember more easily with this mnemonic device, which will help them remember the parts of a fraction. Numerator/Denominator can be learned as North Dakota or Nice Dog. At school or in an after school enrichment program, we learn long division with many methods but with the divide, multiply, subtract, and bring down method, we use the acronym DMSB. A silly little phrase helps our kids remember this long division method. “Don’t Make Sally Break Dance!” will help you remember DMSB. Sometimes kids need help with tough topics such as calculating with multiple operations. In that case, they learn such devices as PEMDAS (parentheses, exponents, multiply, divide, add, and subtract). Just as our kids began to learn more about decimals, they were introduced to the metric system. This gave them such prefixes kilo, hecta, deca, units, deci, centi, and milli: KHDUDCM. When dividing fractions, please keep KCF in mind: keep the first fraction the same, change the sign from divide to multiply, and flip the last fraction. KCF is easy to remember as “Kentucky Chicken Fried,” but it might make you hungry. For our older students, there are just a few things to remember, and FOIL is one of the best. M ove the variable to one side. G et the variable alone. The best way to create a mnemonic device from these sentences is to use the first letter of each sentence to form an acronym with which a new phrase can be formed: SMGC. use to remember the steps to solve an equation. What are other ways of saying PEMDAS than “Please Excuse My Dear Aunt Sally”? I usually don’t remember that one… 🙂 Thank you! Do you have trouble remembering the word PEMDAS, too? 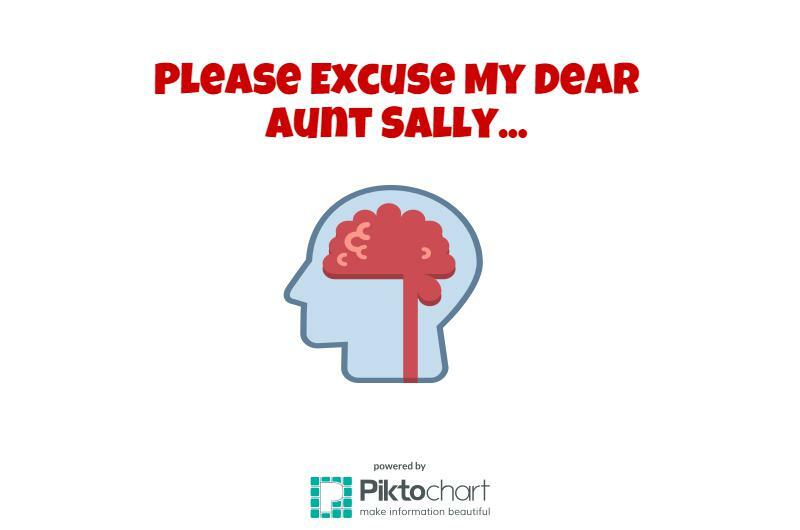 What is it about “Please, excuse my dear Aunt Sally” that doesn’t stick? If it’s not interesting enough or related to something that you like, you could try relating each letter to something that you do like.